The Elgin Symphony Orchestra, led by Andrew Grams, has begun an action-packed season that pushes its musicians in new directions. 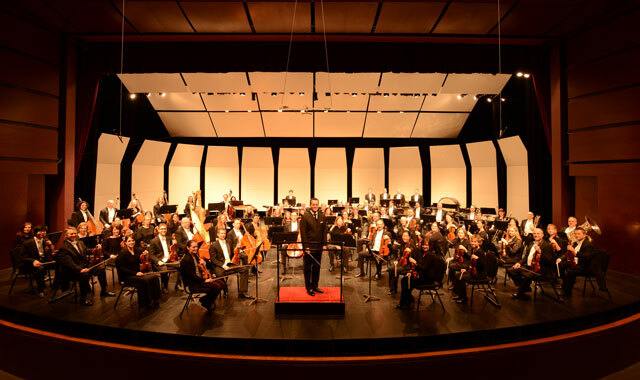 The 66th season of the Elgin Symphony Orchestra (ESO) has only just begun, and it’s already hitting a high note. The acclaimed ESO was recently named 2016 Professional Orchestra of the Year by the Illinois Council of Orchestras, the fourth time it has won the award. This year’s accolades are just the latest in a string of recognition. Last year, Grams, then in his second year with ESO, was named Conductor of the Year by the Illinois Council of Orchestras. This year, ESO earned an honorable mention for exemplary nonprofit management from the Axelson Center for Nonprofit Management, a group at Chicago’s North Park University that seeks to boost nonprofit organizations. This latest award recognizes ESO’s ability to align its programs and goals, while achieving certain metrics. Since its inception in 1950, ESO has made a priority of engaging the community in high-quality orchestral music. Its regular performance schedule brings the orchestra to Elgin’s Hemmens Cultural Center downtown and to Schaumburg’s Prairie Center for the Arts. No matter the venue, ESO has a major impact on the region’s cultural life. Bearden estimates that nearly 20,000 people will experience an ESO performance this season. He enjoys it when these programs can speak to the individual in a meaningful way. • ESO rings in the holiday season on Dec. 10 and 11 with familiar holiday tunes and a sing-along. Special guests Elgin Master Chorale, Anima-Glen Ellyn Children’s Chorus and the Midwest Dance Collective share the stage with ESO. Bearden anticipates another stellar season for ESO, and has his personal favorite circled on the calendar. “I am personally biased toward Mussorgsky’s ‘Pictures at an Exhibition,’ but it is not performed until the final concerts of the season,” he says. As much as ESO is focused on its rousing season, it also takes great pride in its extensive work outside the concert hall. Orchestra members deliver the healing power of music to area hospitals through programs like Musicians Care, a partnership with Elgin’s Advocate Sherman Hospital, and Music Heals, a collaboration with AMITA Health System. In both cases, musicians share their music in the hospital with patients and visitors. “The incredible impact of these programs is reflected in the support from these two great hospital systems and in the letters and commendations the ESO receives from patients, family members, medical staff and other hospital personnel,” says Bearden. “These programs provide great relief during what can be one of the most stressful periods in a person’s life. ESO touches the community in many other ways, too. Wendy Evans, the ESO’s education, outreach and orchestra personnel manager, sees how the orchestra impacts area students. Bearden credits the ongoing success of ESO to a wide variety of people whose input helps each concert and community program to come alive. This entry was posted on Monday, October 10th, 2016 at 12:00 pm	and is filed under Arts & Entertainment, Top Posts. You can follow any responses to this entry through the RSS 2.0 feed. Both comments and pings are currently closed.